Studies have shown that a Basset Hounds overall quality of life depends greatly on its diet. Unfortunately, many of the artificial ingredients included in low-quality dog foods increase a dog's chances of developing cancer and greatly decrease a dog's overall quality of life. We've selected foods below that contain the right mix of quality nutrition your Basset Hounds health depends on. With its adorable droopy face and lovably laid-back personality, the Basset hound is one of the most recognizable dog breeds in the world. Basset Hounds possess a variety of iconic features like a low-slung too long body, short legs with massive paws and a too large head with droopy jowls, extreme floppy ears and a mournful expression completely unreflective of their joyful personality. The Basset Hound, however, is far more than a pretty face. Originally bred in Europe to hunt small game like foxes and badgers, the Basset Hound has a keen nose and surprisingly loud and intimidating bark. Basset Hounds are not fast, nor are they particularly agile or energetic. However, what Basset Hounds lack in athletic ability they make up for with uncanny ability to sniff out and locate game, remarkable intelligence and steadfast loyalty to their owners. The Basset Hounds affable, low-key personality make them a great choice for first-time dog owners and families with children. There is a prevalence amongst name-brand dog food companies to include harmful artificial ingredients in their product. Quality dog foods do not include artificial ingredients nor do they contain grains, wheat, corn, and gluten. Therefore, it is essential for Basset Hound owners to ensure their hound is fed a diet loaded with protein, nutrients, fats, and minerals that support overall health, and healthy growth and cognitive development. The following dog food brands have been vetted and this list is our quick overview of the best dog food brand options for your Basset Hound. Basset Hounds live an average lifespan of 8 to 12 years, but Like all purebred dogs, are susceptible to a number of genetic health issues resulting from years of irresponsible breeding practices. Basset Hounds are also considered low-energy dogs; therefore they are also susceptible and prone to obesity. The best way to ensure your Basset Hound does not develop any of these debilitating issues is by feeding them a healthy diet, and ensuring regular trips to your veterinarian. Obesity in Basset Hounds is characterized by excessive body weight, typically as a result of overfeeding, improper nutrition and lack of exercise. Hypothyroidism is common in canines, and the Basset Hound is no exception. Hypothyroidism is characterized by impaired production of thyroid hormones resulting in a decreased metabolic rate. Symptoms of Hypothyroidism include lethargy, decreased cognitive ability, weight gain, obesity, increased shedding, thickening of the skin and intolerance to cold. Elbow Dysplasia is characterized by growth disturbances in the elbow joint, which may result in chronic pain from arthritis, lameness, and even partial paralysis. Basset Hounds are genetically predisposed to Glaucoma; characterized by fluid buildup in the eye as a result of increased pressure placed on the eyeball. Glaucoma almost always results in total blindness. In general, both eyes are affected. However, in cases where only one eye is affected your vet will take steps to protect the unaffected eye from developing a diseased condition. Opacities within the lens of the eye that can affect vision and lead to total blindness. Cataracts must be treated by a veterinarian from a young age so their eyesight can be adjusted. Patellar Luxation is typically characterized by the dislocation of the knee cap as a result of trauma and/or a genetic malformation. Thrombopathia is a genetic bleeding disorder affecting Basset Hounds; characterized by abnormal platelet function. Platelets are the blood cells responsible for blood clotting. Basset Hounds affected by thrombopathia are at risk of excessive bleeding. This condition should be taken seriously by owners as it can be life-threatening if left ignored or untreated. A canine bleeding disorder characterized by a defective or missing Von Willebrand factor, a protein that enables blood to clot. While some of the medical conditions that can affect a Basset Hounds are treatable, others are far more debilitating, while others are fatal. The best way to ensure that your Basset Hounds lives the happiest, healthiest life it can it is essential that it be provided with sufficient activity, and a diet that consists of the best dog food. Quality dog foods for Basset Hounds are made with quality, natural ingredients rich in healthy sugars like fresh fruits and veggies and quality animal proteins. It is not uncommon for name brand dog foods to include ingredients like brewers rice, and animal meal byproducts. These ingredients act as filler and do not support a healthy canine diet. The best dog food brands contain high levels of animal fats and proteins and do not include artificial ingredients grains, processed flour, dyes or preservatives are a far better alternative. High-quality animal proteins like fish chicken, beef, and lamb should be listed as the first ingredients. Feeding your Basset Hound high-quality dog food is essential. High-quality dog foods are made from beef, chicken or venison and are free of grains, potatoes, and wheat. Feeding your Basset Hound dog foods free of artificial ingredients and rich, healthy proteins, carbohydrates, minerals, and vitamins produce a more luxurious coat, healthier skin and greater quality of life. The nutrition your Basset Hound needs changes throughout the various stages of its life. Check below to see what ingredients your Basset Hound needs throughout its three main life phases. Puppies – Basset Hound puppies require extra-protein to develop into a healthy adult. Puppy formula and dog foods designed for growing puppies are the best choices in your puppies the first year. Puppies should be fed twice a day, at regular intervals, the more active your puppy, the more food they require. Adolescent – Basset Hound older than 6 months need less food than younger puppies. Basset Hound that has reached 75% of their full size need no more than three meals per day. Adult & Senior – Basset Hound over 7 years of age, are considered senior. Senior dogs benefit from a well-formulated consisting of lower calories, sodium and carbohydrates and rich in high-quality protein. Senior Basset Hound also benefit from dog foods containing prebiotics, omega-3 fatty acids, and glucosamine to promote healthy bodily function and a longer life expectancy. 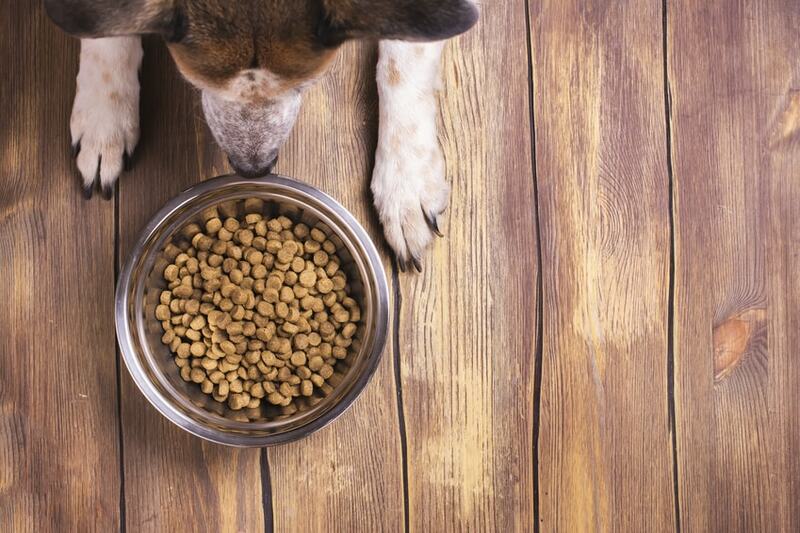 It is not uncommon for low-quality dog food brands to utilize filler ingredients to extend the value of their product. The dog foods featured here are the best dog foods for Basset Hounds because they contain healthy proteins, fats, fruits and vegetables that Basset Hounds need to sustain a healthy lifestyle. Unlike other dog food brands, these brands contain zero filler and no animal meal so you can be sure your Basset Hounds is getting the nutrition its body needs to remain healthy and happy. Formulated with vitamins and minerals, Merrick Grain-Free Real Texas Beef + Sweet Potato Recipe Dry Dog Food delivers grain-free nutrition with ingredients like real beef, sweet potatoes, peas, apples, blueberries. Merrick Grain-Free Real Texas Beef + Sweet Potato Recipe Dry Dog Food supports increased mobility with glucosamine and chondroitin and includes Omega-3 and 6 fatty acids for healthy skin and a shiny coat. The specially designed recipe also contains a full selection of high-quality ingredients which make up a complete and balanced diet. Merrick Grain-Free Real Texas Beef + Sweet Potato Recipe Dry Dog Food supports healthy skin, coat, and mobility, as well as high doses of chondroitin and glucosamine and high levels of Omega fatty acids. As the best overall dog food for your Basset Hound, Merrick Grain-Free Real Texas Beef + Sweet Potato Recipe Dry Dog Food provides everything your Basset Hound needs to live a long, happy and healthy life. Great choice for dogs with sensitive stomachs. The first ingredient deboned beef. Blue Buffalo Life Protection Formula is designed to increase your Basset Hounds overall quality-of-life. Each bag includes real meat, whole grains, garden veggies, and LifeSource Bits, a to add nutrients and antioxidants. Blue Buffalo Life Protection Formula also promotes healthy joints and mobility, which especially important to Basset Hounds who commonly suffer from arthritis. Blue Buffalo Life Protection Formula contains only high-quality animal proteins, fruits and vegetables like chicken, duck, and salmon, apples, spinach, blueberries, and pumpkin. Blue Buffalo Life Protection Formula is made without excess fat to maintain a healthy weight. It also includes L-Carnitine for muscle development and calcium, for strong bones and teeth. NomNomNow is a subscription-based service that revolutionizing the way we look at dog food. Say goodbye to sorting through the dog food isle for quality dog food. With NomNomNow’s Heartland Beef Mash your dog’s specifically engineered diet is delivered to your door. NomNomNow’s Heartland Beef Mash is an all-natural recipe that your Basset Hound will love. The Heartland Beef Mash recipe includes protein and healthy fats calcium potassium, and vitamins. NomNomNow Heartland Beef Mash is also packed with real animal proteins, fruits and vegetables like real ground beef, egg, potatoes, carrots, peas instead of artificial ingredients. Supports healthy skin and coat. Basset Hound puppies need all the protein and nutrients they can get to develop into strong, intelligent Basset Hound adults. Now Fresh Small Breed Puppy Recipe has everything a growing puppy needs to mature physically and cognitively. Now Fresh Small Breed Puppy Recipe provides your Basset Hound pup with 100% fresh turkey, salmon, and duck, as well as omega 3 & 6 oils. The recipe also features wholesome fruits and vegetables like peas, spinach, cranberries, pumpkin, blackberries, alfalfa sprouts, kelp, lentils, and carrots. The best part is Now Fresh Grain-Free Small Breed Puppy Recipe contains zero grains, gluten, wheat, beef, corn, soy, rendered meats, by-products or artificial preservatives. Supports brain and cognitive development. Contains potatoes & potato flour. By feeding your Basset Hound puppy Nulo Freestyle Turkey & Lentils Recipe Grain-Free Small Breed & Puppy Canned Dog Food, you ensure they receive the nutrition they need to fuel healthy development. Nulo’s grain-free recipe features real animal proteins like duck and turkey, as well as a litany of healthy, all natural ingredients like sweet potatoes, chickpeas and lentils. The recipe also features zero corn, wheat or soy which makes it a great choice for Basset Hound puppies with sensitive stomachs. Tylee’s Beef Recipe is human-grade dog food that provides your Basset Hounds with all the benefits of a well balanced, protein-packed diet. Every ingredient included in Tylee’s Beef Recipe is human-grade, which means it can be found in the grocery store or on your dinner table. Tylee’s Human-Grade Beef Recipe Frozen Dog Food includes real, whole foods like SDA beef plus sweet potatoes, mango, broccoli, spinach, and zucchini. The best part is Tylee’s Beef Recipe is human-grade dog food includes zero filler ingredients like corn, wheat, soy, by-product meals. What’s more, Tylee’s Human-Grade Beef Recipe Frozen Dog Food includes zero artificial ingredients like flavoring, coloring or preservatives. Perfect for pets with sensitive stomachs. Includes valuable antioxidants, amino acids, vitamins and minerals. Does not support joint health. Every dog requires a little extra love and attention as they age. Senior dogs especially require extra vitamins, nutrients, and minerals to support healthy joint function as well as a healthy digestive system. Nutro Ultra Senior Chunks in Gravy Canned Dog Food is packed with everything your senior Basset Hound needs to live a long, happy and healthy life. Nutro Ultra Senior Chunks in Gravy Canned Dog Food contains lean animal proteins like farm-raised chicken, pasture-fed lamb, and salmon to provide a beneficial blend of amino acids which support a senior dogs muscles as they age. The Nutro Ultra Senior Chunks in Gravy Canned Dog Food recipe contains just the right amount of protein, fat, and carbohydrates and is specially formulated to support skin and coat health. What’s more, Nutro Ultra Senior Chunks in Gravy Canned Dog Food contains no artificial colors, flavors or preservatives, only high-quality dog food.